and engage you for an evening of art, art, art attack. as Equinox Studios and SANCA (see our map for Art Ride bus stops). All City Coffee presenting paintings by Lucas Irwin. Eight and Sand We live in a era of spying, secrecy, and hypocrisy where the masses are fed misinformation and the government is for sale to the highest bidder. “Criminal State of Mind” is artist Christopher J Olson‘s Orwellian examination of the mindset of the wealthy elite, politicians, and propagandists. Equinox Studios, The big ugly blue building full of beautiful art! Come experience the wonder with over 60 artists in residence and the free Georgetown Artride shuttle to get you here and back.This month featuring Betty Jo Costanzo, Sarah Woodson, Downing Pottery, Karl Seng, Claire Putney, Tabasco Mills and the Iron Monkeys, and much more. As always, bonfires, brats and beautiful people! Fantagraphics Bookstore and Gallery Presents Peter Bagge: “Buddy Buys a Dump.” Exhibition and book signing with musical performance by Kelli Frances Corrado. Georgetown Arts & Cultural Center Open studios! Guest artist, Seb Barnett, presents “Modern Myths”, a surreal painterly vision of modern day mythos. Bring the family! Georgetown Liquor Company presents an encore opening: “It’s the End of the World As We Know It (And We Feel Adorable)”. HappyTime Apocalypse is an art collective that celebrates the balance of dark and light, good and evil, happy and horrified. We aim to create an artistic escape from the horrors of the world that surround us by bringing attention to the humor and beauty within the maddening and grotesque parts of the human experience, illuminating the opposing forces of humanity within us all. The Georgetown Stables: Soul parties are designed to connect you to the truth-telling, mirror-holding, energy-soaked creative goodness that comes when mindful artists let their talents loose! We’ll be displaying the photography of Natasha Komoda, and Naomi Wachira will be playing music. It’s “pay what you will” at the door, and half the proceeds go to Artists Life Guild, a Seattle non-profit that provides low-cost therapy for artists. 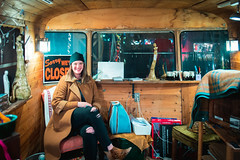 The Georgetown Trailer Park Mall “NIGHT of the GIANT MONSTERS!” Vintage & Artisan Market curated by Sire Vintage, Frida, Make Believe, Beaver’s Den Vintage, Urban Treasury and Special Giant Guest. Krab Jab Studio presents “Daring Stories”, all new work in this solo show of local favorite, Heather Hudson! In this show she explores the world of pulp fiction alongside her usual cornucopia of monsters and oddities. LxWxH Gallery presents “Come Hell or High Water”. In this solo show, Nancy Baker will continue to investigate two-dimensional work mixing digital representations of hardware parts and abstracted forms. In Baker‘s work, chains, rivets, bolts and connectors transform otherwise stoic blue collar objects into transcendent images of floating worlds which are populated by numbers and letters against starry skies. Often citing literary sources, specific phrases wind their way through a labyrinth of connected phrases, jewels, glitter and paper machine fixtures; much like the tales she is referencing. Machine House Brewery presents a group show of plant related art featuring local talent and plant designers. Features include installation and stand alone pieces. Mary Tudor and Ferrell, open studio. Mary Tudor art with timeless, iconic, images verging on being meditative objects, and Ferrell, art with spacial and abstract imaging. Music by Luscious Leopard Lips, the Georgetown atmospheric music DJ with a Theremin synthesizer. RHI Solutions: featuring artist Twozdai Hulse. Pop up art shop at RHI Solutions – worth the trip around the back of the Rainier cold storage. Original and prints of mixed media images of Iconic Seattle. Runway Cafe The works of Phil Keane are original hand drawn, handcut, colored, and assembled 3D drawings inside shadow boxes w/ at least a 1/4″ of space between each layer of buildings or landscape. The shadowboxes are recycled and refurbished to reflect the urban character of the work. Spectrum House Salon & Photography featuring a solo show by Chani Murat,an established artist and tattooer in the Seattle area. Born and raised in the PAC NW, she’s inspired by big bright colors and high contrast images. For this show she will be showcasing a body of work with many different mediums. In addition, Spectrum House always features a boutique stocked with Seattle-made treasures & garments. Studio Sanctum: The Nautilus Studio has changed it’s name to Studio Sanctum, showcasing the realist oil paintings of Jethaniel Peterka and Kyle Abernethy. 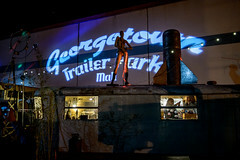 Located next door to the Georgetown Stables. Wittman-Estes: Furniture designed and fabricated by University of Washington Department of Architecture students in collaboration with Kimo Griggs and Danish furniture designer Erling Christoffersen. The exhibit will showcase the newly released designs, completed this spring. Location: Georgetown neighborhood, Airport Way S corridor between Lucile S and Bailey S; over 40 locations! April 12th, Seattle, WA: Word on the street is that there will be Easter eggs stashed all over Georgetown. So, in addition to enjoying art, culture, entertainment, food, and drink, you might be able to find some hidden treasure during April’s Art Attack from 6-9pm on Saturday the 12th. All City Coffee Features “Spitting Image”. In this exhibition, Caroline Roosevelt presents a series of portraits capturing friends and acquaintances in the act of spitting. Playing off the traditional use of portraiture as a means to immortalize aristocracy, Roosevelt bends the genre, depicting subjects in a playful and unflattering, if not realistic, light. The title, “Spitting Image” refers to a portraits intent to capture an exact likeness. Calamity Janes will feature freakish horror illustrations by local artist Nick Gucker and the graphic poster art of local artist Scott Dalrymple. Eight and Sand presents “Stardust”. When we look into the night sky we can be filled with wonder, fear, feelings of insignificance or connection. Are we lone human animals in the vast playground of the gods? We may never know the answer to that, but we do know that we are here and we are a reflection of the chaos and beauty of our magnificent universe. Featuring: Dave Bloomfield, Joseph Brooks, Jenny Dayton, Maxx Follis, Marty Gordon, Jasmine Becket Griffith, Rhodora Jacob, Vikram Madan, Andrew Miller, Christopher J Olson, Rob Ripley, Alexandria Sandlin, Ronnie Taylor, Tiffany Toland Scott, Eli Wolff, Emily Yun. Equinox Studios, of West Georgetown welcomes you to visit our big blue building for artwalk. We run an art shuttle van to Airport Way and back, park here. 6555 5th Ave S, 98108. 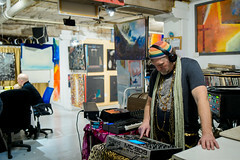 Tim Aguero, photographer, includes an art sale that night. John Kirschenbaum, woodworker and furniture builder. See his new dining set. Anne Sweet, graphic design, often feminist themeology imagery. Rick Crelia, blacksmith, forging it up. Tabasco Mills, blacksmith, also forging it up, and maybe pounding things loudly too. Michelle Smith-Lewis, photographer, mounting a Project fundraiser Art Sale in her digs. Melinda Hannigan, oil painter extraordinaire. Lx Bizarre of The 1979 Bizarre, video art and various media media. 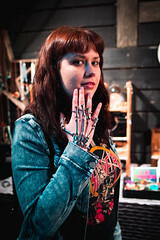 James Ryan, metalsmith, welder, sculptor of metallic things. Claire Putney, alternative drawing methods, also felted jewelry. Fantagraphics Bookstore and Gallery “INTRUDER 10” featuring new comix work by Max Clotfelter, Aidan Fitzgerald, Billis Helg, Ben Horak, Tim Miller, John Ohannesian, Marc Palm, Darin Shuler, James Stanton, Tom Van Deusen, and more! Also, enjoy a Free performance by Stranger Genius award-winner Lori Goldston with Kyle Hanson. Georgetown Arts & Cultural Center presents “Contemporary Myths”. This solo show will feature new oil paintings, prints and drawing by native Northwestern artist Seb Barnett. Nature inspired pop surrealism mixed with a bit of Shamanic electricity. Georgetown Liquor Company presents: “It’s the End of the World As We Know It (And We Feel Adorable)”. HappyTime Apocalypse is an art collective that celebrates the balance of dark and light, good and evil, happy and horrified. We aim to create an artistic escape from the horrors of the world that surround us by bringing attention to the humor and beauty within the maddening and grotesque parts of the human experience, illuminating the opposing forces of humanity within us all. The Georgetown Trailer Park Mall Spring Opener and the Laughing Hare Egg Hunt ~ Vintage and Artisan Market curated by Sire Vintage, Frida, Make Believe, Beaver’s Den Vintage & Urban Treasury. Krab Jab Studio presents the curious works of photographer Norman Taber and the unsettling and beautiful illustrations of Tory Taber, together in their very first Seattle show. Tory will be discussing their body of work at 7:30 pm. Le OBJECTS for the Home: “Bring on Spring”. will be hosting a free class on how to update your home interior on a budget through demonstrating how to bring the outdoors in and create a Spring oasis in your home. These quick and easy fixes are an incredibly affordable way to add and change your home’s décor. Come by and see what we have to offer. Bring pictures of your troubled spots for some advice with purchase. Classes will be casual conversations throughout the evening, taught by designer Timothy De Clue. LxWxH Gallery a•nas•to•mo•sis features a new series of aerial landscape paintings by Claire Johnson. Johnson explores contour, pattern, and color formed either by nature or human intervention across the earth’s surface. In past work, she has explored themes heavily related to the blood of the human body. The connection to this past investigation is tied to these landscapes in the similarities between the branching systems of blood vessels, roads, and river-pathways; linking distant parts or places aren’t obviously connected at first glance. Machine House Brewery A woman’s figure can cause knots in your stomach, make you blush, or simply disgust you. Any and all emotions are welcome when you see “Naked Spring”, watercolors on wood panels created by Dida Lopez. Mary Tudor and Ferrell, open studio. Mary Tudor, 50% off paintings! and Ferrell, art with spacial and abstract imaging. Music by Luscious Leopard Lips, the Georgetown atmospheric music DJ with a Theremin synthesizer. All proceeds go towards our popular KungFu/Animation Camp. Most original paintings in the show will be $10-$60. RHI Solutions: featuring original work and prints from Artist Twozdai Hulse. The Skyline series capture iconic scenes, buildings and signs around Seattle and the greater PNW. SANCA School of Flight has joined Art Attack via the Art Ride bus! Flying trapeze demonstrations by SANCA Flyers and Pay-per-Flight opportunities to fly for Art Attack patrons! Journalists and Press ride free (show your credentials)! Runway Cafe features the visual art of Rafael E. Caraballo and “Soul Attack” with DJ Brownstone following Art Attack. Spectrum House Salon & Photography Andrew Miller’s ‘Spring Fling’ will feature paintings and illustrations from both past and present, centering on change in season and the personal moods that come with it.